Microsoft Sharepoint is a good example of big, generic platforms: It’s so big, so complete, and so robust that we don’t know what we can actually do (or can’t do) with it. It promises many things, some might say, too many. For those who’re exploring collaboration software solutions, it is often hard to discern the hype from the truth, just as disruptive digital technologies like Blockchain and AI. We know these are transformational technologies that everyone is talking about, but most of us don’t have a clear idea of what they can do for us, and how. Today, we want to discern what things Microsoft Sharepoint can do and where it falls short. Also, we want to call into question Sharepoint features and the capabilities its marketing campaigns affirm. The value and adoption of Microsoft products are undeniable but it may be worthwhile to consider Sharepoint alternatives that are better tailored to your specific needs. Sharepoint is anything but “specific”. 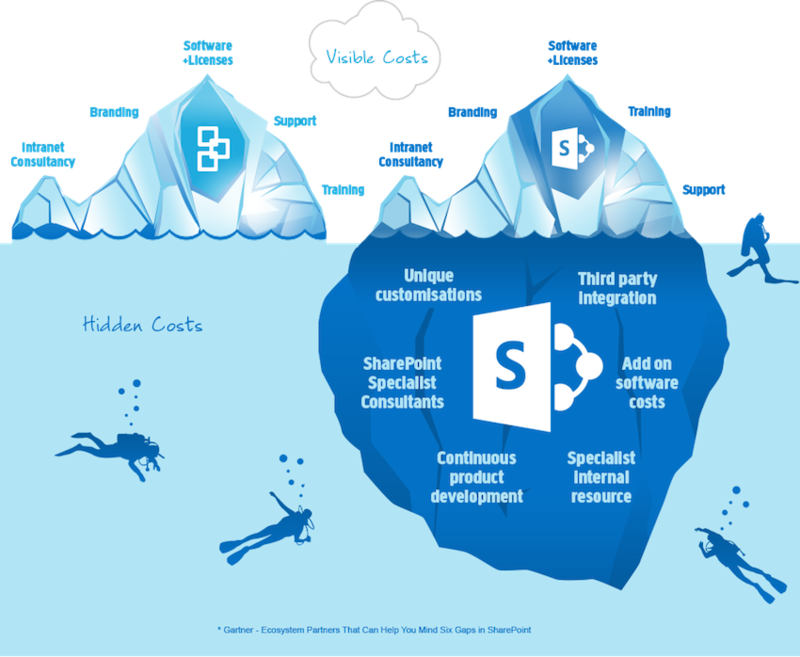 Sharepoint is expensive: the cost per user is just the tip of the iceberg. As the above image exemplifies, you need to consider hidden costs for deployment, customization, integrations, and training. It should come as no surprise that entire companies are built around helping people manage their Sharepoint deployments. If you look at tech review sites, you will find that a common observation about Sharepoint is that is meant for companies with well-established IT departments or often requires a Sharepoint specialist hire for deployments. If you Google “Sharepoint developer” or “Sharepoint Designer” you’ll find thousands of results and searches each month. This raises the obvious question—if you are already paying for Sharepoint licenses—why do you need to pay still more for specialists who will make it work for you? We live in the era of cloud software with exceptional user experiences and simplicity. IT today is all about demystifying technology. This, again, demonstrates the complexity of Sharepoint. 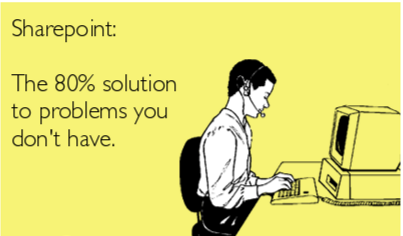 According to a study by AIIM on SharePoint, 58% of respondents claimed user adoption of Sharepoint was a problem in their organization. A common refrain here is that companies fail in their implementations because of the lack of training. Here’s the implicit fact: if it needs intensive training, user experience is a problem —typical of a robust, complex legacy system. You might not be aware, but Microsoft was a late, and somewhat grumbling adopter of cloud computing. This is why when people refer to Sharepoint they are referring to its desktop, not cloud version. It’s also a late adopter of mobile. 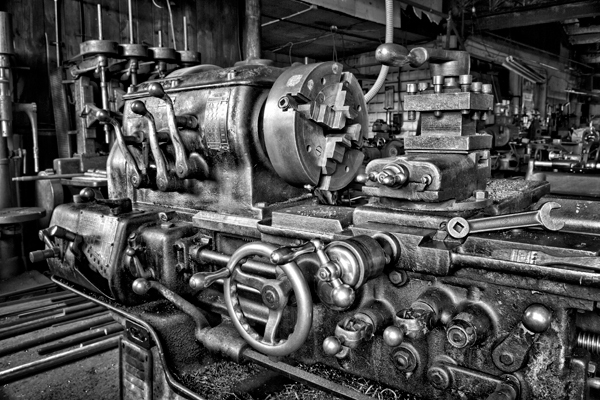 These slow lumbering responses to change are typical of large organizations that are always inclined to defend their legacy markets, and struggle to think and act fast. It is said that the cloud version is still not at par with the desktop version. For instance, when they published their product roadmap, some users expressed concerns about its misalignment and loss on focus. For troubleshooting, the instructions go far beyond “click here, then there” and might actually need you to read commands and tech jargon. Powershell, command prompts…what?? While Sharepoint is meant to solve communication and collaboration challenges, a line of work affair, you need high intervention from your IT department, slowing down your ability to react to business challenges. Compare this to alternatives like HyperOffice, which require minimum effort beyond drag and drop interfaces and filling web forms. There is a false sense of security when providers offer data backups. Most vendors offer backups. However, they do it primarily to prevent accidents from the providers’ side; in other words to prevent data loss, server outages or common infrastructure threats. This is good but but not good enough. These providers don’t necessarily offer backups to prevent against accidental deletions but users. So, while your data may be protected at the infrastructure level, it’s vulnerable at the end-users side. Microsoft doesn’t offer data restoration for these scenarios. Again, the solution they propose is paying more to 3rd parties for data synching. Many users use the desktop version of Sharepoint. The most popular one is Sharepoint 2016 (the last update was 3 years ago), then 2013, while some still rely on 2010 and 2007 versions. Of course, an old version will always to struggle to adapt to the capabilities of new versions—but the problem goes beyond simple compatibility. Some users report in Sharepoint communities how some files, workflows, and processes seem to be interrupted by a warning message that non-technical users cannot understand. Even synching the desktop app with the cloud environment may end up in a mess. Cloud vendors like HyperOffice, on the other hand, continuously upgrade software in the background and users are always on the latest version. If you pride yourself as a tech whiz, Sharepoint is your baby. But not if you’re a marketing manager, an HR executive, a sales rep, or a member of the strategic team, who just wants to focus on their role, and not go running by IT specialists. You may be able to make use of the most common modules, such as document management and Intranets, but the learning curve to excel at Sharepoint so steep that, if you get to the top, you might as well give up your primary job and become a Sharepoint specialist (the money is good!). If you have a broad array of unanticipated future needs – Sharepoint brings you a sophisticated and flexible platform that is a good pick for you. But if you have well defined needs, and value agility and user engagement, you are betetr served by specific solutions in the market – HyperOffice, GSuite, uShare etc. 26% of IT professionals surveyed said their Sharepoint initiatives have stalled. 37% said they were struggling to meet original expectations. 63% said these implementations are “sub-optimum”. And finally, 11% said it was a success for their business. 43% agreed, but almost a half perceived a “loss of focus”. 20% said Sharepoint is under threat from other cloud systems. 75% are strongly committed to implementing SharePoint. Less than 8% are considering replacing it with an alternative.